Stratocaster pickups with alnico rods are very simple in structure. There are few components. 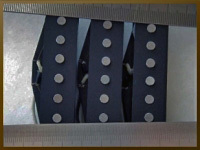 The pickups do not have pole screws or other metal parts which could affect the sound, which is why the significance of the quality and type of magnets and magnet wire is accentuated in Stratocaster- type pickups. The correct type of winding pattern is also crucial in creating a killer Strat sound. The Stratocaster has been my favorite electric guitar since the mid-70's, which is why I've put an immense amount of time and thought into the developement and testing of these sets. -Plain enamel: Insulated with a film of oleoresinous enamel, single build. Pe is the oldest of the film insulations. Late 60's Fender straocaster pickups. Tight low-end, snappy highs. -Formvar: Insulated with a polyvinyl acetal resin, heavy build (double build). Fender used Formvar at 50's and early 60's. Round low-end, clear highs. -Copper-clad steel base plate for bridge pickup. Adds bass and power.